Sunday: 9 am; 10:30 am and 12 noon. Monday – Friday: 9:30 am. About Askea Church: The site acquired for the Church was part of the farm of St Dympna’s Hospital, Carlow. 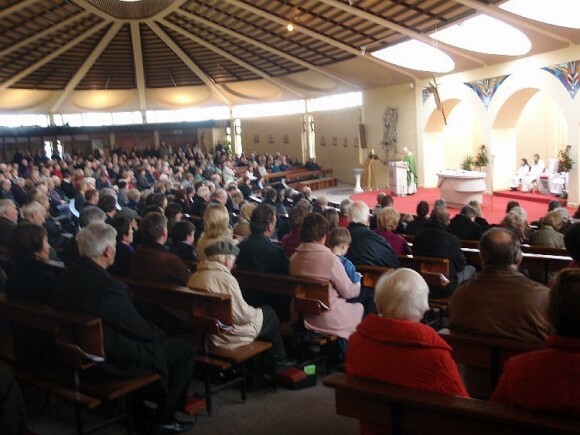 Askea Church was opened in a ceremony performed by Bishop Patrick Lennon. The first resident priest in Askea from 1976 was Fr Francis MacNamara C.C. Holy Family Church served as a relief church for the Cathedral parish, which in the previous twenty years had experienced a considerable population growth. Bishop Larry Ryan constituted Askea as a new parish in 1990. The Church is of a unique architectural style, oval in shape. The image which inspired its design is the Old Testament moving Tent, which contained the Ark of the Covenant during the period after the Exodus, when the people of Israel wandered through the desert towards the Promised Land. Thus the roof is of a particularly unusual design. 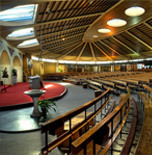 The seating arrangement accords with the curvature of the outside walls and slopes towards the sanctuary. The resulting effect is one of greater participation in the liturgy. The baptistery and the tabernacle areas balance each other on either side of the altar area. Thus great prominence is visually given to the two Sacraments (Baptism and Eucharist), through which members are initiated into the family of the Church. Repairs were made to the roof in the mid 2000s. The interior of the church has been completely refurbished in recent times. Askea (Easca, Eascach or Eascaigh; a march, connected with Eisc, a water channel; all derived from the word Uisce, meaning water).